I am honored to be the Keynote speaker on June 8th at the Pink Out event held yearly in Hanover, PA (from 6:30 – 10:30 pm). The event is held at the magnificent and extraordinary home of Jane and Mike Rice, owners of Utz Potato Chips. 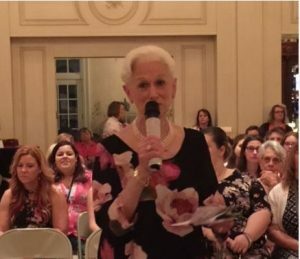 Jane is the founder of this foundation which is supported by a group of amazing women, who are mostly survivors of breast and gynecological cancers. These women work tirelessly throughout the year, donating their time and energy to prepare for the four-day Pink Out event – and other events as well – in order to raise funds for financially needy women in the community who are diagnosed with cancer. 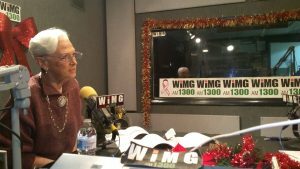 The funds raised by the Pink Out help women who can’t work and have no health insurance but have medical bills to pay – as well as those needing funds for food, medication, childcare, paying their rent or mortgage, utilities, etc. The Pink Out has also raised money to support local hospitals, including the Children’s Hospital of Philadelphia. For the past few years, it has been a pleasure for me to attend the Pink Out experience. Each joyful event is filled with good food, gifts for everyone, door prizes, a live and silent auction and 500 women dressed in various shades of pink. Jane also graciously invites all guests to tour her home – a real treat. I feel very fortunate to have this opportunity to speak with those attending this Pink Out event. The title of my presentation: What Does Love Have To Do with Healing? Everything! I wish for each of you a beautiful summer – filled with time to enable you to catch your breath and truly relax. Be sure to check back with us, as I am looking forward to the fall and the many opportunities we have already scheduled to meet and speak with you. 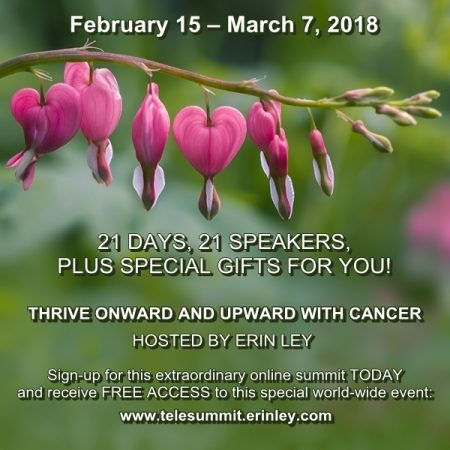 This your chance to listen to Susan’s interview with Erin Ley from the THRIVE ONWARD AND UPWARD WITH CANCER: Instantly Boost Your Quality of Life FREE Online Telesummit. 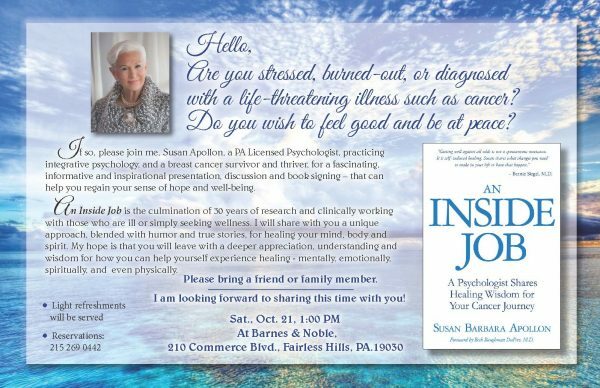 This your chance to listen to 21 professionals and healers who have all been affected by the cancer diagnosis, either directly or indirectly. Erin Ley, is a single mother who was diagnosed with Non-Hodgkin’s Lymphoma, told she would die, and, yet, she lives and thrives! Erin has dedicated her life to helping those with cancer live a full and rewarding life. She is the host of the new online interview series. REMEMBER!!! The more knowledge you have at your fingertips related to your health and your life, the greater the advantage you have in enjoying a wonderful quality of life following the conclusion of your treatments. An Inside Job For Healing Cancer – Susan Apollon Interview with Beth Dupree, M.D. WXPR is an NPR affiliate, broadcasting to the Rhinelander, WI area. WNCT-FM is a station broadcasting in Greenville, NC and the surrounding communities. Interview with Dean’a Kodiak.KFBK Radio is a news/talk station broadcasting to the Sacramento, CA area. Susan Silberstein, Ph.D., Founder and Educational Director of The Center for Advancement in Cancer Education, author and founder of BeatCancer.org, interviewed Susan about her journey which has led to the creation of An Inside Job: A Psychologist Shares Healing Wisdom for Your Cancer Journey and A Companion to An Inside Job. Pure Healthy Living ran the article by freelancer Brandi-Ann Uyemura on An Inside Job. Click here to view the article. Vitality ran an article based on the “It’s Time to Answer Cancer’s Wake-up Call to Life: Seven Healing Principles to Guide and Heal You Along Your Cancer Journey. Click here to see the article on Page 13. Let’s Get Healthy is a weekly talk program interviewing leading physicians, researchers and authors from around the globe on the hottest topics in health and medicine. Hosted by Bill Swail, RPh, and presented by Peoples Pharmacy – Austin’s Favorite Pharmacy – this program brings you a balanced look at the latest information on the topics of nutrition and medicine. It airs on KJCE-AM to the Austin, TX area. Poppoff is a fast-paced magazine radio show discussing current hot button issues. It airs on KAHI-AM to the Sacramento, CA area. Heath Matters airs on WOCA-AM, a news and talk station broadcasting to the Ocala and Northern Florida area. Heathwatch covers a variety of health issues as it encourages the audience to call with questions or concerns. It broadcasts on KBOO-FM to the Portland, Oregon area.